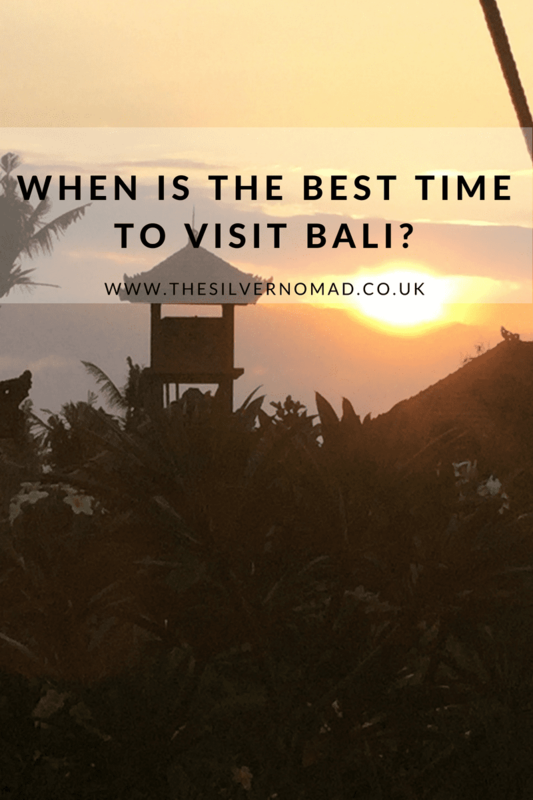 One of the most frequent questions I get asked is “When is a good time to go to Bali?” Personally, I would say anytime is good in Bali, but I don’t mind the sun or the rain, either is beautiful to me. Bali lies just south of the equator and has a tropical climate with temperatures around 24°C to 33°C all year round. The Balinese year tends to be split into just two seasons: the wet season and the dry season, both with their merits and drawbacks. Don’t be put off by the rain in the wet season. The rain may be heavy at times, but it is generally warm and moves quickly leaving plenty of sunshine hours to enjoy the beach and see the sights. You can more or less set your clock by the rain – morning showers and afternoon sun. As it is low season, everywhere is quieter: the beaches, the restaurants, the temples, even walking along the street is more pleasurable and less crowded during the wet season. Prices for accommodation also tend to be lower too, which is a bonus. Nyepi, the Balinese New Year, is celebrated on a moveable date in or around March each year. It is a time of contemplation and reflection and is marked by a day of silence. No-one leaves their home, lights are not put on, food is not cooked, and the whole island is quiet. Even the airport is closed for the Nyepi. It is said that the evil spirits pass over the island and don’t linger as they think it is deserted. The day before Nyepi is the Ngrupuk parade. Each village creates rather grotesque Ogoh-ogoh statues to depict the mythological beings from the Hindu religion which are paraded through the streets on plinths carried by eight or more men and accompanied by music played by the youths of the village. At each crossroads or T-junction the Ogoh-ogoh is turned anti-clockwise three times to confuse the evil spirits and make them go away. The Bali Spirit Festival is an annual celebration of yoga, dance and music which takes place in Ubud and bases itself on the tenets of Balinese Hinduism of living in harmony with our social, natural and spiritual environments. The Festival offers workshops, seminars, a market and healing centre. As the dry season approaches, Bali starts to get busier, with May to September being the most popular due to the low humidity and the warm weather. So although there will be a few crowds, just chill out in the perfect weather as there are lots of things to do including lying on the beach, visiting temples, surfing, diving and snorkelling. From the second Saturday in June until the second Saturday in July, the annual Bali Arts Festival is held with a varied schedule of art performances at the Denpasar Arts Centre. There are traditional dances, costume parades, art displays, exhibitions and musical performances throughout the month. Don’t miss out on the grand parades that usually take place at the Puputan Square in Renon, Denpasar. The annual Bali Kite Festival celebrates of one of the cultural icons of Bali, the traditional Balinese kite! Village kite troupes from all over the island take part, showing off their large traditional-style kites, as well as more contemporary designs. Dates vary due to the weather conditions, but generally between June and August. Galungan and Kuningan are Bali’s most important festivals. The whole island celebrates for 10 days with feasting and festivals to coincide with the wuku year – 210-day cycle of the Balinese calendar. Penjor, bamboo poles with offerings suspended at the end, are displayed on the right side of the entrance to every house. It is believed that during this ten-day period, all the Balinese gods will come down to earth for the festivities and when Dharma (Virtue) is victorious over Adharma (Evil). Kuningan, is the last of the ten days brings the holiday period to a close and is a day for prayer and special ceremonies. Down in the south west of the island, the Makepung Buffalo Races start their heats in July. There are 9 heats spread over 7 different courses at 2 weeks intervals culminating in the Finals in mid-November. The heats take place on a Sunday with a 7.30am start and a dozen pairs of pepadu racing and about a hundred others taking part in kind of fashion parade. When is your favourite time to go to Bali? Thanks! We’d like to go to Bali next year, so I was wondering about this. Do you also have a suggestion for the best place/island to visit? We would really love to see some of those gorgeous beaches and really relax.